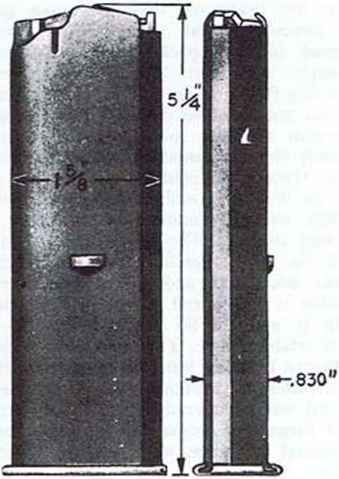 HT11 5 . The AUG HBAR features a heavy barrel fitted with a muzzle compensator and a bipod. It is usually used with a 42-round magazine, but can use the smaller 30-round magazines as well. The HBAR variant is very accurate sometimes it is fitted with a receiver housing that has a standard scope mount -T designation to take advantage of that accuracy. Steyr offers a Kahles ZF69 6 power telescopic sight with the -T model. Intended as a CQB weapon for hostage rescue and similar use, the Ruger MP-9 blends featu from both Uzi and Ingram. It has a collapsing stock that is easy and fast to deploy yet sturdy, a semi-foregrip to help control the weapon and other ergonomic improvements. 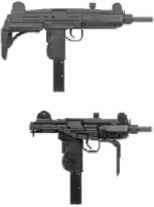 Unlike Uzi or the Ingrams, the MP-9 fires from closed bolt for accuracy. 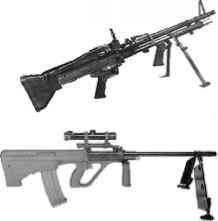 Guns Rifle for single shots, Guns Light Auto for burst fire. With the stock folded, Holdout -2, SS 9, Acc 3 and burst Rcl rises to -2.